I woke up this morning with a long list of things I wanted to do, but it all went wrong the moment I discovered the Japanese '8Bits Fanatics II' site, the guys responsible for last year's very tongue-in-cheek The Tempura Of The Dead and the more recent Aban Hawkins & the 1000 Spikes, both of which remain XBLIG exclusives. 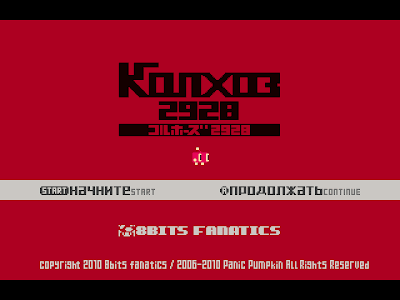 However, before these two games they released a number of Windows releases, and although they don't match the quality of their Xbox counterparts they've still provided me with enough of a distraction so that I failed to achieve anything else today - none more so than Kolkhoz 2928. First Person Shooters have come a long way, baby. From the early, ceiling-texture-free days of Wolfenstein 3D, through the grime and darkness of Quake, the headcrab infested territory of Half Life and the melancholy anticlimax of Duke Nukem Forever all the way to the Commodore Vic-20. Yes indeed. The Keep weighs in at a tiny 3.5 kilobytes, boasts Wolfenstein 3D style graphics and gameplay and runs on a humble, unexpanded, Vic-20. Apologies for this, but I am currently swamped with orders for the Edge Grinder cartridge, so there may be a delay in shipping them out to you. All orders will be met, but it might take a bit of time! The RGCD C64 cartridge development competition prizes have been confirmed, one game has been submitted (complete) and several new contenders have signed up - so it's about time I gave a proper status update of the work in progress projects and introduce the teams/individuals involved. So, in alphabetical order of developer, here are the entries so far. Voting is under way for the Commodore 64 Sideways Shoot 'Em Up Construction Kit contest we covered last month, with four more entries beating the submission deadline. Here are the rest of the contenders! 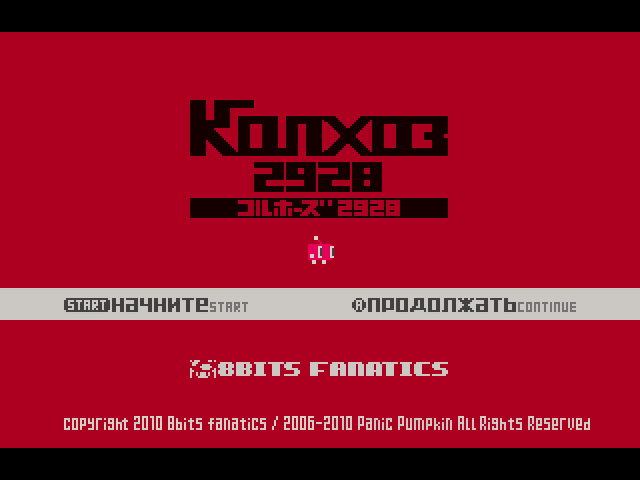 Cosine's latest game is finally complete and the cartridge is ready to purchase from our shop page! Coded by T.M.R, featuring a new soundtrack by Odie and graphics and map design by Smila, the digital version of the game should be available for free download from the Cosine home page and Format War in the next day or so (when Jason gets a chance to upload it). There'll also be a new video posted up soon showing off the new music and slight tweaks to game-play, but in the meantime, check out the cart with it's internal colour-shifting LED! This is the tale of one Walter Raleigh and, although you might have heard a version of his story during school history lessons, the odds are that it won’t be quite the same as the one offered by Jamestown; for a start, the game takes place in November 1619 and he's already spent a year running from the executioner's block in the knowledge that only the furthest flung British colonies will offer sanctuary... in particular, those on the planet Mars! But Walter hasn't arrived in the New World on a whim, one colony has pretty much disappeared and his hope is that if this mystery can be solved his overdue execution will be annulled. 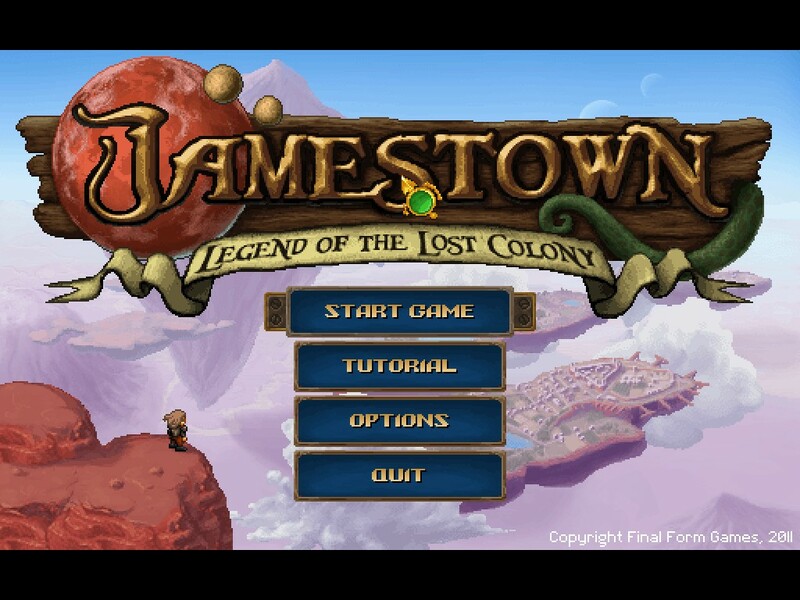 Jamestown is a 2D vertically scrolling shoot 'em up which has a fetish for large amounts of bullets but, to begin with at least, only some of its five stages can be selected from the main menu. As players become more proficient they can unlock the remaining levels and harsher difficulty settings through the in-game shop, although actually getting all of the levels opened is something of an achievement in itself since by the final stage the game will insist that the preceding levels be completed on one of the higher difficulty levels before it'll hand over the keys. If I had to sum up my experience of playing Secret Base's recent addition to the Tobe (& Nana) franchise in three words they would have to be charming, endearing and frustrating. The former two adjectives describe the game's visual appeal, gameplay and premise, whereas the latter represents how I felt several times during my play-through the game due to the occasionally inconsistent controls and minor bugs spoiling what is otherwise a fantastic platformer. However, I really hate to sound ungrateful, (especially as Ray was kind enough to mail me a pre-release review copy) so before making a critical analysis of the game's few shortfalls, lets first cover all the stuff that Tobe's Vertical Adventure does right. 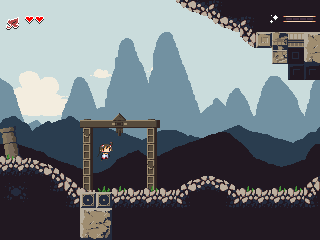 Tobe's Vertical Adventure sees you play the role of Tobe or Nana (or both in co-op mode) on a quest to recover lost treasures from 16 different caves (spread across 4 different worlds). In each cave you must first descend to the bottom, navigating past traps and hostile critters, collecting jewels and rescuing trapped animals until you finally reach your goal - a large treasure chest. Opening this chest initiates an earthquake, and then it's a race back up to the surface through a now reconfigured cave layout before the timer runs out. There are balloons and ropes scattered throughout the caverns (to assist with descent and ascent respectively), and multiple ways to beat each level. It's a simple concept, and as a whole it works really well. Although I recall reading about the first instalment of Momodora back in August last year, I never got around to playing it. Perhaps it was the fact that I was put off by the combination of 'exploratory platformer' tag and 'Cave Story'-esque visuals, fearing that I would be seriously underwhelmed by anything that attempted to blatently bite Pixel's style? Probably. However, after reading the positive feedback on indiegames.com I decided to give the sequel a try - and as it turns out, I'm glad I did. 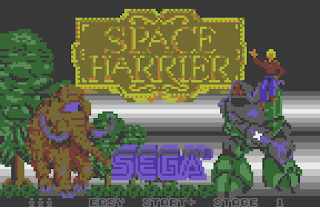 When Space Harrier levitated into the arcades in 1985 minds (and wads of small change) were blown. Its cash-sucking gameplay was backed up by high-speed 3D graphics processing that dropped jaws across the world. Now the classy old blaster has been ported over to the XE/XL range of Atari 8-Bit microcomputers. Without the processor muscle and fancy soundboard of an arcade cabinet, this port of Space Harrier is still unquestionably stunning. 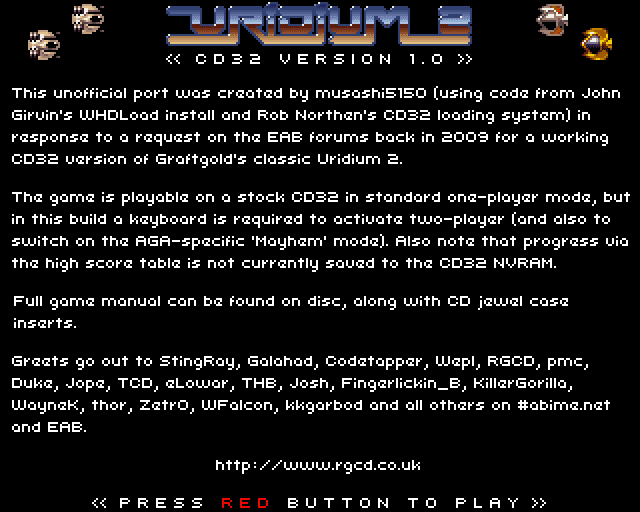 Uridium 2 is without a doubt my all-time favourite shmup. I still distinctly remember the day I first played the demo version at a friends house back in the 1990's - I was an Atari user at the time, but after experiencing this 16-Bit update to Andrew Braybrooks classic C64 shooter I raided my savings account and bought a brand new Amiga 1200 to play it on. I've still yet to find any other shooter that plays as well in two-player mode, or matches the sheer thrill and excitement that Uridium 2 delivers. Flying low over the leviathan ships whilst simultaneously avoiding surface structures, blasting enemy attack formations and bombing vunerable ground targets into space dust never gets old, and the reactor-core minigame that follows after landing on each crippled alien warship provides both variation to the game and a great way to stack up points and power-ups for the next assault. 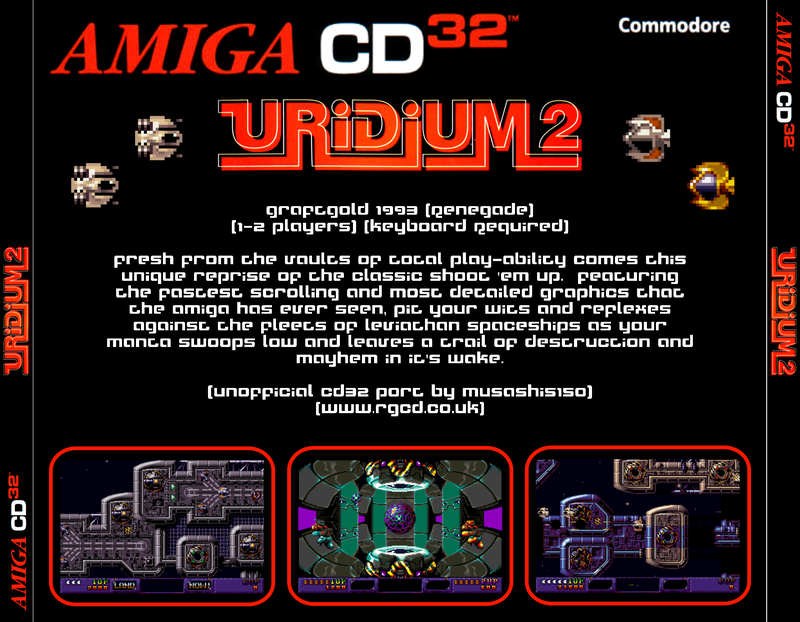 Originally scheduled for release on the CD32 but pulled due to Commodore's increasingly shaky hold in the 16/32-Bit market, Uridium 2 was the killer app that the console never had. Set to feature improved 256 colour graphics and a new CD soundtrack by Steve Turner, I can still recall the disappointment I felt when I saw the game removed from the 'comming soon' listings. I imagine that I wasn't alone. 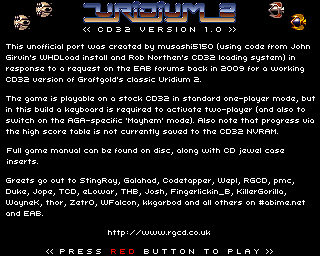 I always wondered what happened to the CD32 version of the game, especially as a CD32 is the only 'real' Amiga hardware I own these days, so I sent an enquiry about the game to Steve Turner via his Graftgold site. The response I received sparked my interest further; initially Steve was under the impression that a CD32 version was actually completed and submitted to Mike Montgomery at Renegade, but after confirming facts with Andrew Braybrook it seems that only the CD soundtrack was finished and work on the actual conversion had barely started (more news on this soundtrack to follow soon). Still eager to play the game on real hardware I posted a request on the EAB forums asking for help porting the disk version of the game to the CD32. Musashi5150 stepped up to accept the challenge, and this unofficial port based on John Girvin's WHDLoad slave and using Rob Northen's RNC CD32 loader is the result of a few weeks work. 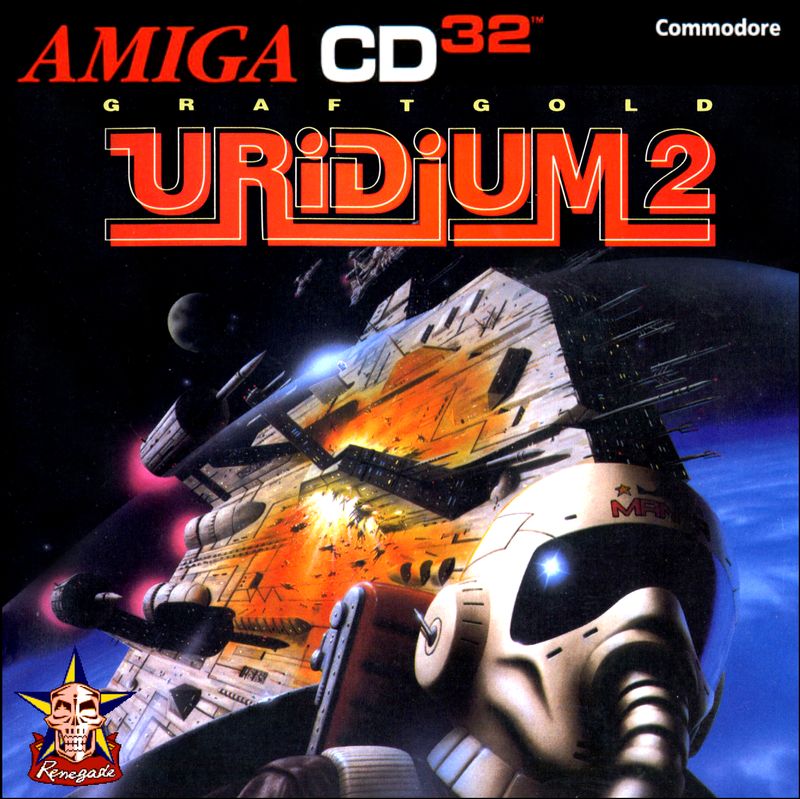 Although perfectly playable on a standard CD32 console in one-player mode, this initial release isn't 100%; a keyboard is required to access the two-player and mayhem modes and progress isn't saved to NVRAM via the highscore table (meaning that you'll need to replay previously beaten fleets). There's also one small break in the music during the loading sequence, but this minor gripe is nothing compared to the seizure-inducing flashing and stuttering present in the WHDLoad version without preload! Anyway, I won't make any promises, but some of these issues *may* be addressed in future. Until then, thanks to musashi5150's work CD32 owners can finally enjoy one of the best hard-core shooters of the 16-Bit generation, and keyboard owners will have the added bonus of access to all the game-modes. 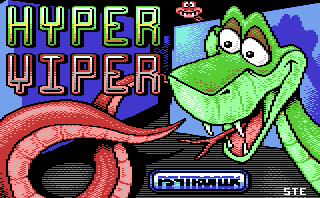 Not to be confused with the recent BBC Micro game (which confusingly has the same name), Hyper Viper is in fact a new C64 title from Exeter-based programmer Jamie Howard, and the latest release from the hyper-prolific 8-Bit publisher Pystronik Software. Based on an obscure MSX game that Jamie used to play as a kid, Hyper Viper may look like a pacman-clone or snake/nibbler derivative, but the game concept is actually quite different from these oft-aped retro-gaming staples. In Hyper Viper the player's goal is to chase the snakes around a maze, gobbling them up from behind whilst avoiding being eaten themselves. Accidently bite into the middle of a snake and it will split into two, and although you can grind the 8-way scrolling levels for points and extra lives by eating the fruit bonuses, the little critters that drop them also occasionally lay eggs that hatch into 'blue meanies'; very fast and invulnerable variations of your character who will eventually hunt you down if you take too long to clear a maze.